Published on March 29 in Science Advances, experimentally demonstrates for the first time that it is possible to efficiently describe a quantum state, using the tools of computational learning theory. In fact it is known that in general the description of a quantum state requires a number of parameters that grows exponentially with the number of particles that compose it. For example, the amount of data needed to represent a state of just 37 particles would already be enough to exceed the amount of data currently generated on the entire planet. 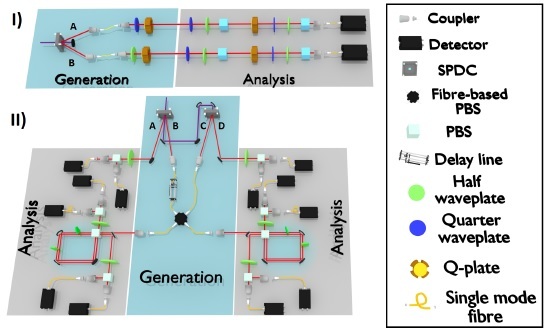 This work is the result of the collaboration between the Quantum Lab coordinated by Fabio Sciarrino at the Sapienza University of Rome and the UCL in London, with the precious contribution of Scott Aaronson of the University of Texas at Austin. In particular, the experiment, carried out on a photonic platform by the team of the Quantum Lab della Sapienza, demonstrated an important theoretical result by Scott Aaronson. On the basis of this result, the complexity of the description of a quantum state is only apparent: in reality, in a probabilistic sense, a number of measures that grows linearly with the number of particles is sufficient to describe it in an approximate way. This result has significant implications for our ability to model quantum systems. In fact, an approach widely used over the last decade to reduce the complexity of physical models is machine learning. Algorithms based on neural networks are now a valuable tool and also used in physics, in all cases where it is necessary to look for patterns in data that escape with other types of analysis. Unfortunately, the validity limits of this type of algorithm are unknown and consequently its results, although surprising, can only have an indicative value. On the contrary, in the case of Aaronson’s result on which this work is based, it is possible to precisely quantify the accuracy of our description of the system.